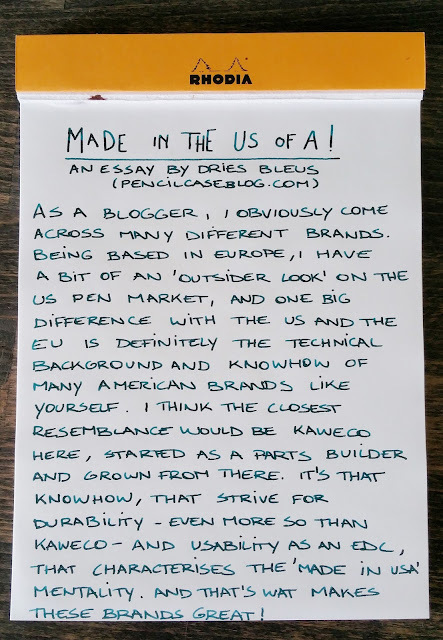 "What 'Made in America' means to me. I sketched the idea out in pencil and inked it with my copper Fountain K."
Phillip submitted this original design for a custom desk for consideration. Not all artwork hangs on walls. "So here is my "Made In America" "artwork". Not all art has to be on canvas. Everything you see here is Made in America! Everything used to build this was Made in America. I had a request to build a holster and saddle bag so that a cowboy could carry his Bond Arms Derringer "Snake Slayer" (made in Granbury, Texas) with him out on the range to combat his rattler problems. I designed and hand made this to fit his needs and I only use materials made to last and Made HERE! I ask you What's more American than a old west style derringer custom leather holster and saddlebag, fit for a cowboy to use?" I honestly didn’t think much of his comments at 12 years old, but now that I’ve grown to appreciate hard work and commitment to one’s craft, his words resonate deep within me. To be Made in America means that great care was taken to develop and build a finely made product, everything thing from trucks and cars to knives and pens. These things are made by American people of our own cities and neighborhoods. These men and women and moms and dads who work with great pride in what they build. We often unknowingly rub shoulders with them every day, and they are putting in hard hours of work to produce something that will not only be useful for us today, but will be useful for our children and grand-children as well. To be Made in America means taking pride in what we make and in how we make it. We don’t cut corners to save on production costs because that inevitably compromises the quality of the product. We take our time to develop something people will appreciate and are happy to use as often as they can. Yes, the end cost may be a bit more, but we know that when we buy American, the product will last and so the few extra dollars are worth the investment. When so many hours and days are put in to constructing a product, you want your name to go on that product because you are proud of it. Other hard-working Americans are going to purchase your products with their own money, and we owe it to them to create useful things that they will never regret purchasing. To be Made in America means that our companies and small-businesses are employing fellow Americans which keeps our dollars in our own country rather than supporting the economies of other nations who do not hold the same values as we do of quality work and commitment to one’s craft. Other countries may make things cheaper, but we make things better, and that really does mean something. 6:30 AM- ­I’ve already hit the snooze button three times now. One might think that this is because I hate my job and can’t bear to face the day but the reality is, I just really like to sleep. I am truly blessed to have one of the best jobs on the planet. The first thing I do before dragging myself out of bed is to be grateful for my work, for the day, for my supportive husband, and my two furbabies. It’s time to get up and be amazing! 7:30 AM­- Breakfast burrito and coffee in hand, I head out. It’s gonna be a great day! I spend my long commute to work contemplating what my day is going to be like. It’s when some of my best ideas hit. That, and when I’m in the shower. Has anyone else experienced this? 8:00 AM­- Strolling down the street from the garage to the office, cat­ear headphones blaring some Lindsey Stirling or maybe some Swedish House Mafia, I’m getting pumped! This is part of my morning routine. I unlock the back door, disarm the alarm, and drop my bag in my “office.” I don’t actually use it except for storage. Nobody is in yet. It’s too early for that. This is my time. I walk through the double doors from the back offices into the main space. The lights are all off and it is so quiet. For me, this is a sacred moment. It represents potential energy, the calm before the storm. I take a moment just to stand in the darkened commons, letting the peace of the space fill me. This is another moment of gratitude that starts the day. I owe this place my life, after all. It has forever changed me. By now, you are probably wondering, “Where on Earth does this girl work? !” and you’ve probably guessed that it’s not your typical office in corporate America, either. It is quite the opposite. I work in the community center and maker space, CREATE at Arizona Science Center, where our motto is to Inspire, Design, Make, and Connect. We are the very definition of what it means to be Made in America. We exist to inspire the young makers out there but also to rekindle creative confidence in adults. I don’t think I have to tell you that this country is in trouble on this front. According to a study by Adobe conducted on 5000 individuals in 2012, 8 out of 10 of those individuals felt that unlocking creativity was critical to our economic growth but only 1 out of 4 of those same people felt as though they were living up to their creative potential. It’s for this reason that I think we feel we have to outsource to other countries to meet the growing demands of this nation. There are so many people that visit CREATE where I see this lack of creative confidence. These same individuals are the ones that ask us if they can pay us to make them something but that’s not how we operate. We supply the means, the resources, and the training to get you started and then it’s up to you to fulfill your dreams or needs, in some cases. So many of these folk shy away, as soon as they are told this, claiming that they aren’t nearly creative enough to make their vision a reality. It is sadly this mentality that has the country under its thrall. We can’t figure out how to build XYZ? No problem, let’s just ship the idea to China to figure out and engineer. They’ll probably do it cheaper, too. There is a bright side to this dark tale, however and it the part that gives me hope. CREATE probably has close to 30 active pass holders now that use our space for various projects. Some of them are even running their own business by selling their creations. These folk are the beacons, the voices that are speaking out against the apathy and proving that, yes, it is possible to make a living off of your own ingenuity. They will also be the first to tell you that it didn’t all come easy, either. They’ve spent months, maybe even years refining their products to their exacting standards of quality. There is a level of pride in their work that can’t be experienced in anything you’d pick up at your local big­box store. CREATE is only one part of this revolution that is changing the way people think and what they value. This movement is a united front of artisans, craftsmen and women, inventors, engineers, and entrepreneurs that are slowly bringing back traditional skills and trades into the public eye. We represent what it means to be Made in America. This movement is the voice that reminds people that there is real value in learning these crafts or supporting fellow craftsmen, to leave something meaningful to future generations. I mentioned that I owe CREATE my life. It wasn’t too long ago that I was one of those many people, stuck in a dead­end job, uninspired and seemingly trapped. I had talent as an artist and a seamstress but I wasn’t willing to make the leap to do it professionally. I was too scared of failure and the uncertainty of it all. Now, not only do I get to practice my craft everyday, but I get to teach others and hopefully get them to realize that they have the ability to do the same. My husband has made that realization and together, we have plans to start our own shop so that he can get out of his dead­end job. I’m proud of our work and I am hoping it inspires others to follow so that one day, this country will realize that there is no need to outsource, that we have plenty of talent to solve any problem the universe throws our way. We are the Makers of America. So, I'll call this an essay, maybe it's more of a ramble. When I see "Made in America" on a label I always start asking myself questions. Where in America? By whom in America? Generally I see the label and associate it with Craftsmanship. That's Craftsmanship with a capitol "C." That's blood sweat and tears capitol "C." But what happens behind the label? That's what I want to know. I can easily see both extremes. I'm going to talk about the great equalizer; Hamburgers. I'm fortunate. I live in an old mill building that used to make shoes. In this old building, in the bottom floor is a brew/pub. I can walk down there in my slippers in the dead of winter and get quality beer and a Hamburger. Not just any hamburger, but one made in house, by hand with local ingredients. That cow had a name. Not only did it have a name, but the person who brought the meat to the brew/pub knew that name. So as I sit there in my slippers and drink my handcrafted beer, I think about all the effort and love that went into my lunch. Local growers for the lettuce/tomato/hops... Betsy or whatever her name was for the meat... Loving kneading hands from the kitchen staff for the bun... That's made local, made in my town, my county, my state. That's made in America. I have a friend who loves McDonald's. Says they're an all American company. Started and grown here. Represents the American dream. Made in America. I nod. I smile. I keep the questions about the origins of all the ingredients to myself. I try not to think about the many nameless creatures (hopefully all cows) that went into the burger and gently steer the conversation elsewhere. Therein lies the root of my questioning; Is it because INSERT ITEM HERE is simply made in America? It can't be only that. What else is it? At work I deal with "Buy America" laws that make our non-profit public transportation agency jump through hoops ensuring we purchase vehicles that are "produced" in America. With parts from where? Assembled where? Where did the metal come from? More questions. I'm fortunate; I found love. I'm married to a Swiss woman. I'll be joining her in her homeland soon. So, to ask the question from a different point of view, what does it mean to be, "Made in Switzerland?" I can walk through Zürich and see the Schweiter Heimatwerk stores. Swiss Handcraft for those that don't speak Swiss German. Lot's of touristy stuff, but all crafted with love by hand. Lot's of Swiss army knives. Made in Switzerland. There's a lot of pride surrounding what is made in Switzerland. And there's a lot of it. Made in Switzerland is far more common for the Swiss than Made in America is for us here. There a lots of factors in that; trade agreements, European politics and the small matter of those gosh darned big mountains in the way. But to see the craftsmen and women selling their goods, to see the general population going out of their way to ask, not just "Is it made in Switzerland?, but to ask which Kanton (state) or even village it was made in... That's amazing to me. There aren't a lot of Hamburger restaurants in Switzerland. It's a specialty item. I can find a good one... I know who to ask. I could also go to McDonald's in Zürich. I would pay a lot more for that hamburger than I would at a McDonald's here. More questions, but that one has an easier answer; that person selling me a Big Mac is earning a living wage. At McDonald's... That's amazing to me. So I won't go so far as to say that I'll buy a hamburger from a Swiss McDonald's simply because I know I'm supporting the people who actually made said hamburger, but that is getting close to my question. What does "Made in Switzerland" mean? What does "Made in America" mean? For me, ideally, it means that when I buy this item, whatever it may be, I am supporting the people that brought it to be, not some nameless, faceless company, American owned or not. Someone touched this. I want them to be able to live, find love and be happy. I want my purchase of this item to directly benefit those who touched it, who dreamed it, who crafted it. I want their blood sweat and tears to be valued. So for me, "Made in America", our own Heimatwerk, means this was made by Betsy. Thank you Betsy. You made a damn fine burger. Thank you Karas Kustom for the opportunity to submit this. And thank you for all of you blood, sweat and tears. What does made in America mean to me? Am I unpatriotic? No. Am I un-American. Definitely. Don’t get me wrong I love America. I’ve been there a bunch of times and I love the place and I love the people. Yosemite, Grand Canyon, LA, New York, New Orleans, New Hampshire. Fantastic. I’d even love to live there for a few years. But I’m not American, and never will be. So the words “Made in America” don’t count for much on the pride front. If I said they did I’d be a liar or crazy. So, what does Made In America mean to me. Let’s take a look at the alternative. Made in China? Those words could mean anything. China is capable of manufacturing awesome stuff to incredibly high standards. iPhone anyone? But they also make the world’s worst crap, like 99 percent of stuff you find on Ebay and the entire contents of a $1 shop. “Made in China” can mean so much that it ultimately means nothing. If you’re going to make something in America you’d better have a good reason for it. Making stuff offshore is cheap, and it might even be good. Maybe. When someone decides to make something in America they are doing it because they want to make it themselves, and they want to make it themselves because they’re passionate about it. Where there is passion there is commitment. Where there is commitment there is skill and care and talent. If someone is making something in America they are going to use great materials to honour their high labour costs. They are going to use the most skilled craftsmen and they are going to care about what they are doing and how they are doing it. This is not somebody’s else’s work. This is not being done just for the money. This is being done out of pride - not necessarily national pride - but the pride of self, the pride of good workmanship. In short, made in America means that the thing I’m buying is going to be pretty damn good. We appreciate everyone who took the time to send us their thoughts, artwork, and photos. We will surely do more of this kind of thing in the future. We would be nothing without our customers and their support. One of our essay winners is going through a rather tough time right now. He and his family have been caught in the flooding in Louisiana. But they reached out to me today and let me know they are all right and have started the recovery process. His closing to his email is rather poignant and sums up a lot of my feelings on Made in America. Here's what he said. "Just another note about being Made In America. The past 4 days I have witnessed firsthand that Americans help each other in times of crisis and tragedy. Our city and region has experienced the worst flood on record, and so many people have gone out of their way to help others. The best thing Made in America is the people, who not only make great products, but who make sacrifices and rise to the occasion to help a neighbor in need."